Try the award winning Doodle God! Create an entire universe by mixing and matching different combinations of earth, wind, air and fire. Of course, the universe was not created in a day. You’ll have to work your way up from simple microorganisms and elements to more complicated animals, tools and even armies. Creator beware, this kind of power may have unintended consequences as creating something as harmless as the wheel could lead to a zombie plague… Fortunately, you are not alone on this cosmic journey. The greatest philosophers and comedians of all time are here to impart their wit and wisdom to help you on your way. 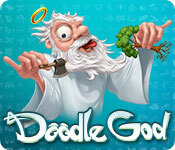 Doodle God is rated 4.5 out of 5 by 2. Rated 5 out of 5 by scritchity from Voice acting and wit are unrivaled It's hard to find a game where I don't have to mute or skip when the voiceover starts. This game has an awesome voice actor (don't know who you are, but thank you!) and a lot of witty puns and general fun. Game play is straightforward and entertaining. If you want something different, challenging and unique--and one that may actually make you laugh on occasion--this game is worth it. Rated 4 out of 5 by pennmom36 from THAT DOODLE GOD GETS AROUND! I totally get this puzzle game, it's not going to be everyone's cup of tea because it takes a lot of patience and it will bore some players to tears. It's a simple game but not an easy game to master, and it can become quite frustrating trying to figure out how to create new elements and become a Doodle God. There have actually been a ton of Doodle God versions released and I'd love to see BF pick up these games as well. This edition of Doodle God has a Kid Safe Mode that I'm assuming doesn't allow them to create questionable elements or turns down the dial a bit with the comments because Doodle God has quite the sarcastic sense of humor. 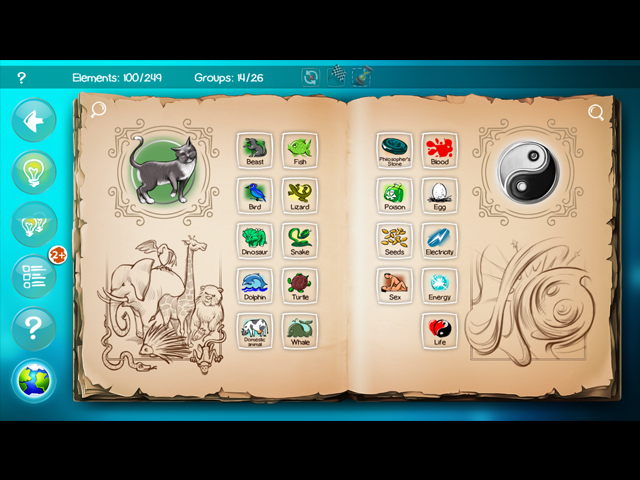 There are 19 Trophies available and 13 Artifacts to earn by creating specific artifacts using 3 given elements. There are 11 side quest Puzzles available that tasks you with creating a specific category such as a Jack-o-lantern, the Easter Bunny or 4th of July Fireworks etc. 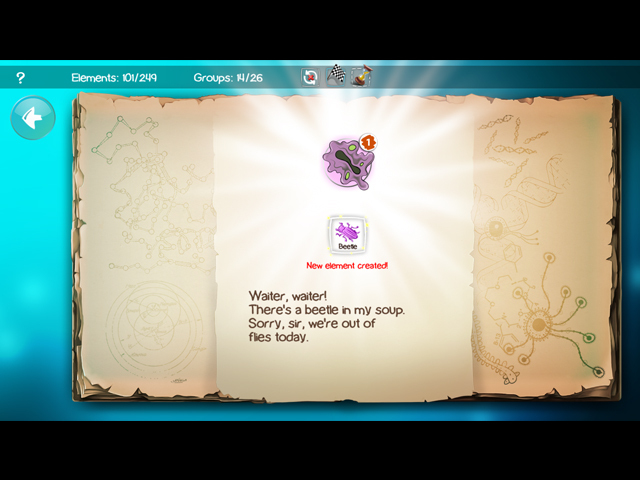 There is an Encylopedia that lists the elements alphabetically and 4 different side Quests available as well. You begin the game, well, In The Beginning of course, with 4 simple Elements, such as Fire, Water, Earth, and Air. The goal is to combine 2 elements to make a brand new element, which can then be combined to make even more elements, 249 Elements in 26 different groups. 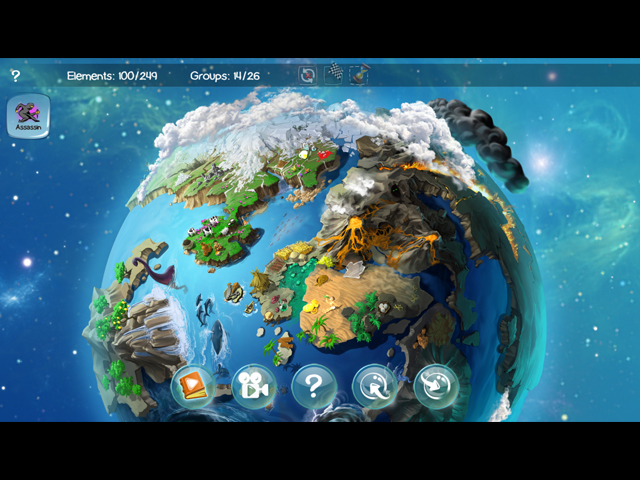 There are 4 different Categories in the main game to progress your Doodle World, Beginning to create the world from scratch, Technology to create new technology, Modern Age to create a more modern up to date world and World of Magic to create fantastical elements such as dragons, unicorns, and wizards. Keep an open mind and discover what it's like to create your own Doodle World. It's really kinda cool when you use your imagination to create elements. The humor is an added bonus!